The Stork enamine reaction is a method for alkylation or acylation of ketones through intermediates enamines. Ketones cannot be directly alkylated or acylated but when treated with secondary amines they are converted into enamines which can further react with various reagents. Thus, enamines can react with alkyl halides forming alkylated carbonyl compounds, and also can react with α,β-unsaturated aldehydes or ketones forming acylated carbonyl compounds. hydrolysis of alkylated/acylated enamine back to starting ketone or aldehyde. 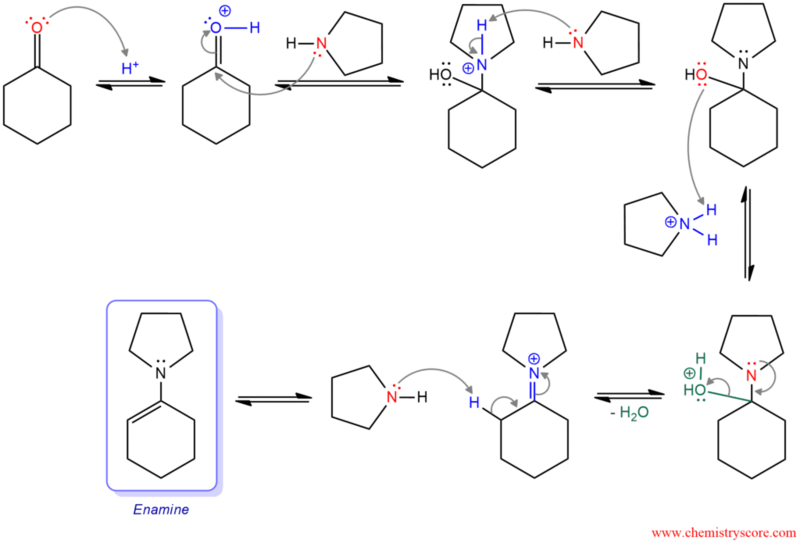 The beginning of the mechanism is the same for all further reactions regardless of which reagents are added. First, the ketone is protonated and becomes a good electrophile for the nucleophilic attack by pyrrolidine. Pyrrolidine is bound to the carbonyl carbon and π bond is broken. Hydroxide is a bad leaving group and must be modified to a good leaving group. This can be achieved by protonation of a weak base: pyrrolidine first removes the hydrogen that is on the nitrogen and then transfers this hydrogen to the hydroxide. A lone pair on the nitrogen will form a double bond and expel water. 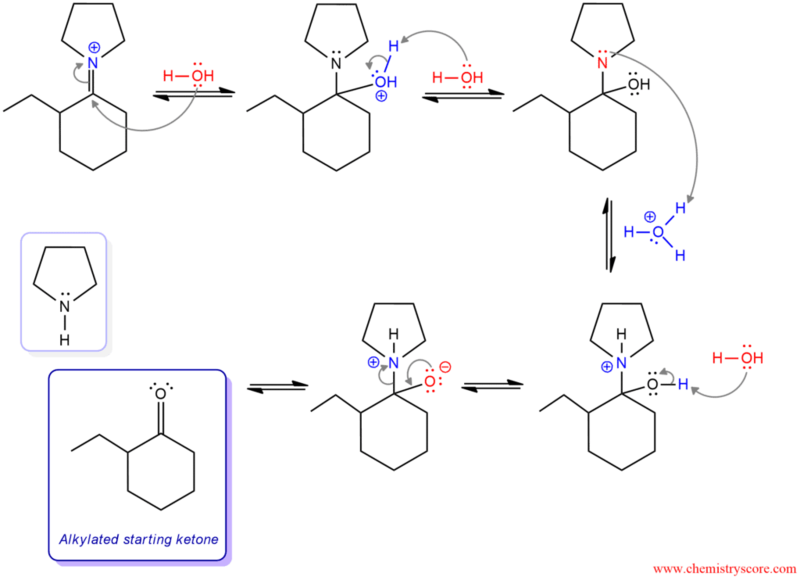 Another molecule of pyrrolidine will remove the hydrogen in the α position (position next to the carbon-nitrogen double bond) and form a double bond. Electrons from carbon-nitrogen π bond will break and return into a single bond and a lone pair to the nitrogen. When the enamine is obtained, it can be subject to the Michel addition with α,β-unsaturated carbonyl compounds or alkyl halides. In the following example, enamine will be added to the alkyl halide. A lone pair on the nitrogen forms a double bond and push electrons from the existing double bond to attack carbon bonded to the bromine. The bromine is expelled as a leaving group. This mechanism is opposite to imine formation and analogous to enamine hydrolysis. First, water attacks the carbonyl carbon of iminium ion, and positive charge is removed by deprotonation in the next step. Hemiaminal is formed as a neutral intermediate. Protonation of nitrogen, followed by deprotonation od hydroxide leads to the formation of secondary amine and alkylated starting ketone.